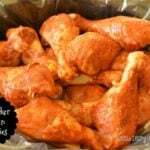 Slow Cooker Spicy Orange Chicken Drumsticks – These babies are falling off the bone when they come out of the slow cooker, then they get basted with a sweet and spicy barbecue sauce…grab a napkin they are messy in a good way! 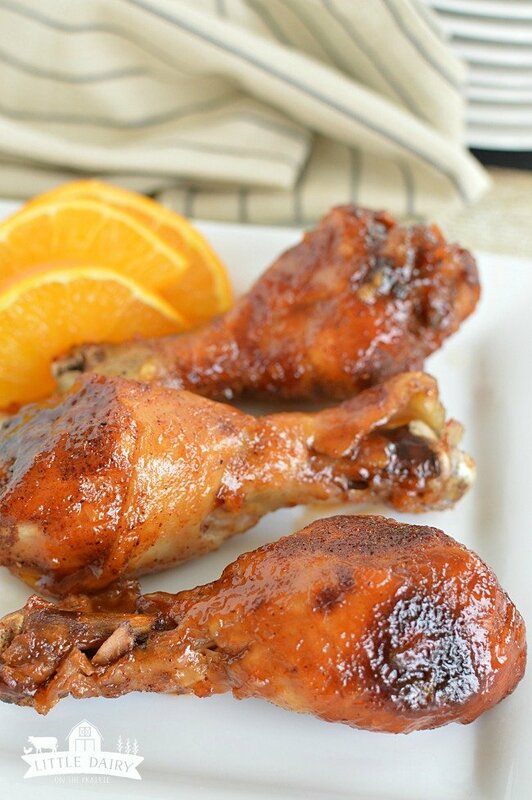 Slow Cooker Spicy Orange Chicken Drumsticks – so much to love! Hopefully you love your slow cooker as much as I love mine! You just can’t beat throwing dinner in there and coming back to dinner that’s ready! Every day three growing boys slide their two feet under my table and let me tell you they can really put away the groceries while they are sitting there. When I find a budget friendly, yes I mean down right cheap, meal that my boys all love…it’s not only a winner at the table but in my pocket book too! Add rub ingredients to a gallon sealable bag. Next, add chicken drumsticks and shake to coat. Then, set drumsticks in slow cooker. Add chicken broth to the bottom of slow cooker. Mix prepared barbecue sauce, orange marmalade, chili powder and cayenne pepper together. 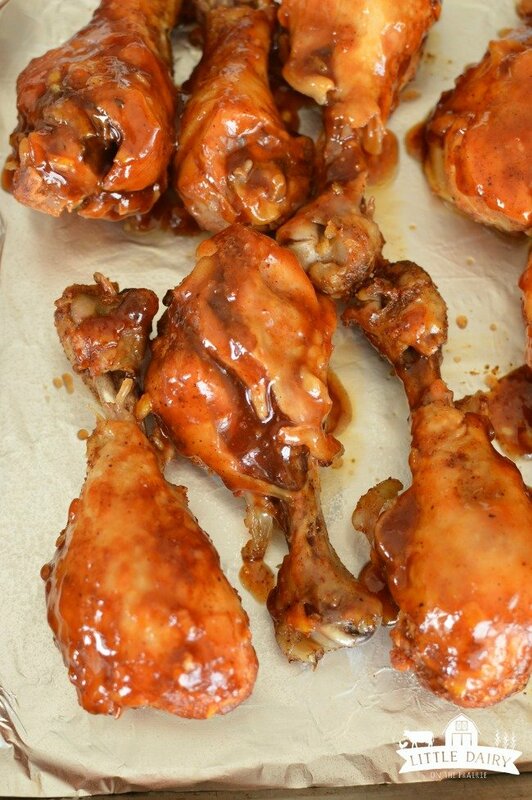 Drizzle half a cup of sauce over drumsticks, reserve remaining sauce for later. Cook in slow cooker on high for 4 hours. Preheat oven to broiler, I leave my rack about 6 inches from the broiler element. Line a baking sheet with aluminum foil, spray with non-stick baking spray. 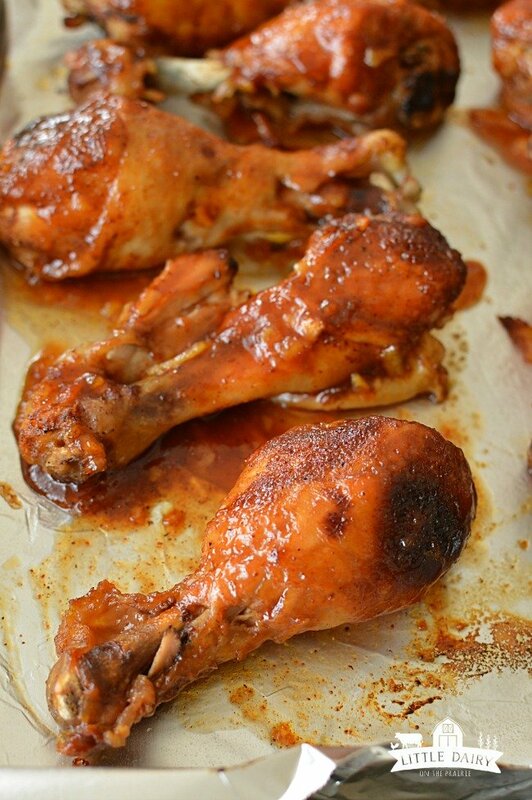 Remove drumsticks from slow cooker and lay on baking sheet. Broil for 3-5 minutes. Remove from oven, baste again, and broil for 3-5 more minutes. Serve immediately! I like to save a little extra sauce for dunking! 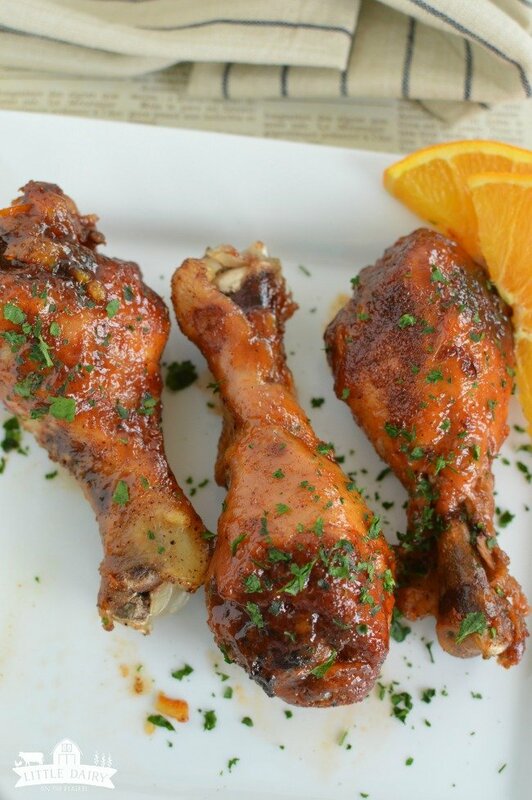 Whether you are looking for game day food, and easy dinner, or party food Spicy Chicken Orange Drumsticks are just the thing! My kids love them, my kids friends (some of which eat at my house more than their own homes) love them, and my pocket book loves them! Do me a favor and make them ASAP and let me know what you think of them! 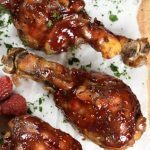 Slow Cooker Spicy Orange Chicken Drumsticks – These babies are falling off the bone when they come out of the slow cooker, then they get basted with a sweet and spicy barbecue sauce...grab a napkin they are messy in a good way! Pour chicken broth or orange juice to the bottom of slow cooker. Mix prepared barbecue sauce, orange marmalade, orange zest, 2 T. orange juice and chili powder together. Drizzle half a cup of sauce over drumsticks, reserve remaining sauce for later. What a brilliant idea! 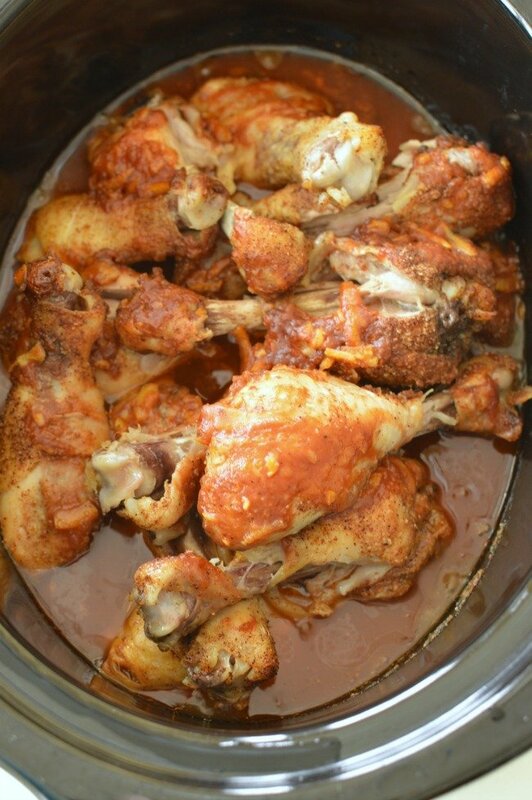 We’re HUGE slow cooker fans, too, and I love the idea of making drumsticks in the slow cooker for the whole fam. Well done! Thanks! You can’t beat a budget friendly dinner that the whole family loves! Especially if all I have to do is throw it in the slow cooker! Orange chicken is one of my favorites and these look like such a party friendly way to serve the great flovors!!! Mine too! Party food is so much fun! My mouth started watering as soon as I saw these. I mean, THAT GLAZE! That sticky, spicy, and sweet glaze is my favorite part! I love that these are made in the slow cooker! Me too! The slow cooker makes my life so much easier…an my house smells amazing while they are cooking! 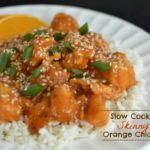 I love this idea…orange chicken has the BEST flavor! I agree! Orange Chicken is one of my favorites! Ooos! I just added it! Lately I’ve been substituting orange juice for the chicken broth and I love it! Either works great! Me too! My slow cooker saves my life! This flavor combination is my new favorite! 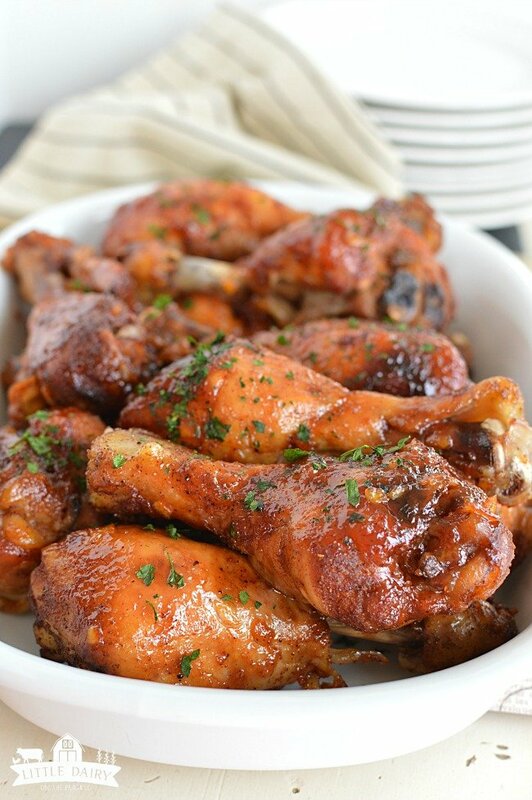 I have a gas oven with no broiler…any ideas for how to finish off the drumsticks? Should I just bake them on high heat for the same amount of time? I haven’t ever tried that but I’m sure it would work just fine. Just watch them close so they don’t burn. These are a perfect gameday food! There are sure to be a hit at my next party! My family gobbles them up during the first quarter of every game! Hello! 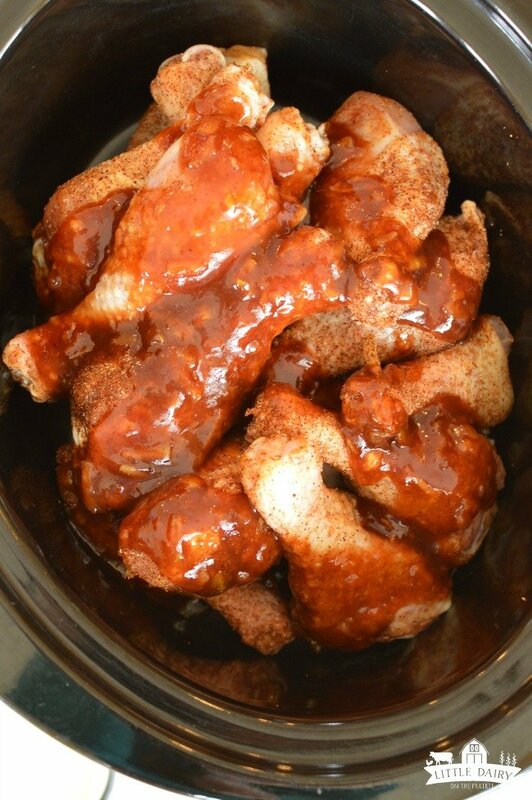 I have this on the crockpot already, so I winged it lol, but is the cayenne pepper in the rub and the sauce is in the rub group, but in the directions is in the sauce. Also when you say to add the chicken broth to the crockpot, are you talking about the orange juice? I read the other reviews and you said you have been substituting. Thank you, can’t wait for the house to start smelling good! I can see why this recipe was a little confusing. I went back and edited it. The cayenne pepper if in the rub. I don’t use much because my family can’t handle it. You can use 1/2 cup orange juice or chicken broth to pour in the bottom of the slow cooker. Either works well. 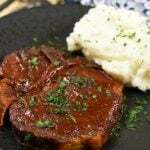 There is an additional 2 Tablespoons of orange juice in the sauce. And yes…the house smells divine while these are cooking! Hopefully that clears the instructions up. Let me know if you have any more questions. Never used my slow cooker before…. In the ingredients section, chicken broth isn’t listed, so I didn’t buy any… how much do I need to put on the bottom of the cooker? Can I just use extra oj instead? Like I said earlier, I’ve had this cooker for at least 10yrs and never used it…. Been concerned about things getting stuck on the bottom and burning while unattended for long periods of time. So many people say how great they are….. We’ll see! I’m so excited you are breaking out your slow cooker! You are going to love it! They are so handy and make my life so much easier! I just clarified the recipe so it should be a little easier to understand. Sorry I left the amount of chicken broth or orange juice off the ingredients list. I add half a cup of orange juice or chicken broth to the bottom of the slow cooker before I start cooking the drumsticks. Hopefully this helps! Let me know if you have any more questions! I think you are going to love them! Can the drumsticks be frozen in the beginning or do they have to be thawed? I always make them after they are thawed! Just discovered your blog through another blog and I am loving it. Just a quick question…..are these with the skin on or off? Thanks can’t wait to try them. Welcome! I’m so glad you found me! I leave the skins on when I make these drumsticks! Enjoy!